I found myself spending too much time customizing my computer so I removed windowblinds which caused the loss of almost all of my icons. I reinstalled windowblinds and they're back. SO... How do I restore the original default Windows theme before removing windowblinds? Windows 7 x64. 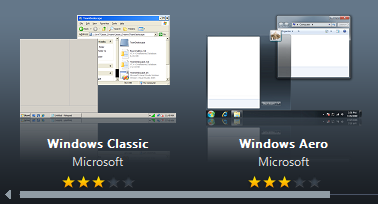 Open the WindowBlinds config, and apply the theme 'Windows classic'. WindowBlinds doesnt affect your icons, in any way. Must be something else 'interferring'. This will get you back to your defaults. Also, when you say you lost your icons, do you mean the images were blank? Or were the files themselves not there? Was this just on the Desktop? I'm asking because this is very odd behavior to have connected with WindowBlinds. IconPackager I could understand, but WindowBlinds...? WindowBlinds doesn't affect icons. Did you use MyColors or IconPackager? From the elevated command prompt, you can run sfc /scannow (right click on cmd and 'run as administrator')... might help if msstyles type software is involved. Also, the advice re: Icon restoration is good, and works. I did have iconpackager installed, and I see it's installed now, even though I didn't knowingly install it. So, how do I deal with iconpackager? Yeah, the icons are just blank. Pure heii on the quick launch. Allow that to run. Then try IconPackager again as in the screenie above. If that doesn't help, please reply and we can try something else. Save to your desktop, then right click on the file and select 'Run as Administrator' if you're on Vista/7, or just run it if you're on XP. There may be some 'module could not be found' errors, which is normal. Then reboot your computer. You rock Doc! Applying the default windows icons in iconpackager did the trick! Welcome badamsiyns... Thanks to Rosco_P and Zubaz, as well. I just got lucky. They know what they're doing. Yes. We totally know what we're doing. That fire was totally not our fault. Eyebrows grow back, right? And by "not our fault" we mean that we may have had some interaction with fire at some point.